Generations of Dolan women have been blessed—or cursed—with the "sight," but none more so than four-year-old Jenna. To save Jenna from their wicked stepfather's greedy clutches, spinster Sophie Dolan kidnaps her little sister, poses as a widow with a young daughter, and accepts a job as schoolteacher in rough-and-tumble Tanglewood, Nevada. To Sheriff Ridge Hawkins, the world is black and white, wrong and right, and nothing in between. If he gets wind of a kidnapper in his town, Sophie will lose the little girl she loves… and her freedom. Ridge knows the fiery redhead is wanted—by him. In fact, she's everything he ever wanted: strong, loving, and as passionate as a man could wish for. But when he discovers that Sophie is a virgin, and not Jenna's mother after all, he goes on a hunt to discover what else she's hiding. 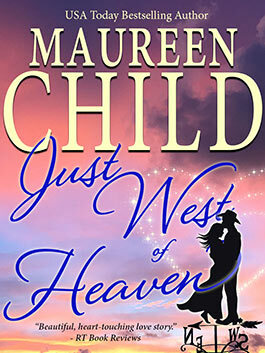 Will Ridge have to choose between the woman he loves and the law he believes in? Website copyright © 2018 Maureen Child. All rights reserved. Website design by Web Crafters.